I have always been curious and slightly amused by wallpapers containing imagery of cob webs. Seems to me people are always taking brooms and vacuum extensions to get rid of these pesky things and I could not understand why people would buy papers with these spider-inspired motifs to decorate their homes. The sample I’m showing was produced from 1906-08 and was available in five different colorways, all very pale shades of off-white, yellow and green. Due to the very pale coloring and subtle patterning I would assume these were intended to be used as ceiling papers. The pattern is non-directional which can also indicate its ceiling intent. The design on most ceiling papers was non-directional so the pattern would appear the same when viewed from anywhere in the room. The earliest paper I found containing printed cobwebs was one designed by Louis Comfort Tiffany, which was illustrated in the catalogue “What Shall We Do with Our Walls” written by Clarence Cook in 1880. While this may seem like a Victorian stab at humor, or possibly a way to mask the inevitable appearance of these in one’s home, it did continue into the 20th century. William Justema designed a similar pattern called Web for Katzenbach & Warren in 1948. 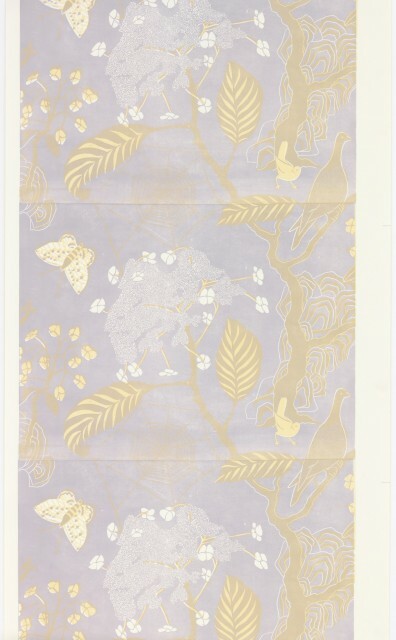 This was printed by silk-screen, the latest technology in wallpaper printing. Justema’s Web was also printed in a subtle color on a taupe ground, and as ceiling papers were in fashion into the 1950s, this could have been designed for either the ceiling or the wall. 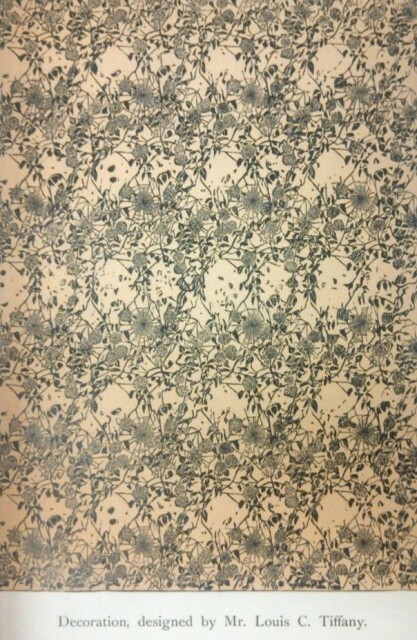 In 2004 Marthe Armitage produced a wallpaper titled Cobwebs, which was printed by linoleum block. While the design contains other elements along with the cobwebs, the web is central and shown delicately suspended in a tree. This pattern was designed with a vertical format and was intended to be used on the wall and not the ceiling. Ceiling paper, USA, 1906-08. Machine-printed on paper. Gift of Dorwin L. Starr; Web, designed by William Justema, 1948. Gift of Jose Fumero, 1949-134-11; Cobweb, designed and printed by Marthe Armitage, 2004. Gift of Marthe Armitage, 2005-26-1.